The trucking business is known for its lengthy payment terms, which can stretch smaller businesses thin. Small carriers must compete with the larger networks of big carriers, and have to remain flexible with a restricted cash flow. If the payment terms stretch out to 60 or 90 days, it can be problematic for any-sized carrier that needs to refuel its trucks, make insurance payments, and cover maintenance costs. With contractors and subcontractors thrown into the mix, payments can be delayed well beyond the terms of the invoice. It’s possible for small trucking companies to overcome waiting to get paid with invoice factoring. 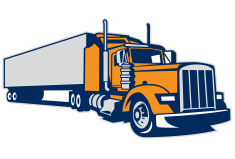 Invoice factoring is a popular form of financing for small trucking companies since it doesn’t require a strong credit score or a lengthy operational history to qualify. Instead, it relies on the credit status of your customers. The process is simple: once a contract is booked, email or fax your customer’s information and contract details to the factoring company for review and approval. After 24 hours, your business will receive a direct deposit for up to 95% of your invoicing. When the invoice is fully paid by your customer, the remaining balance will be received minus factoring fees. Another major advantage of using a factoring for your trucking company is the invoice collection process allows you to keep the same payment terms with your customers. Many factors also provide a fuel advance card, which is paid back from the proceeds of the invoice. Fuel advance cards allow trucking companies to pay to haul the freight the moment they pick it up. The costs of freight factoring depend on how often it is utilized as it can range from 1 to 5% monthly, depending on the advance rate and if your received a fuel advance card. For those who haven’t yet had the opportunity to build business history and credit, receivables financing is the best available option that can keep you in business. Freight factoring can help open doors to new opportunities while bridging the cash flow gap. If your trucking business is lagging in its payment terms, factoring may be your best option to grow. An easy, transparent process to get funds in 48 hours or less. Request an intro with basic info about you and your business. We’ll call you to confirm and ask any additional questions. We’ll connect you to the funder that best fits your needs. The funder will request an app and info to underwrite your deal. Funding occurs within 24 hours after approval. Grow your business and be happy.